Car companies are bringing back discontinued vehicles, and those rebirths are being announced at this year's North American International Auto Show. 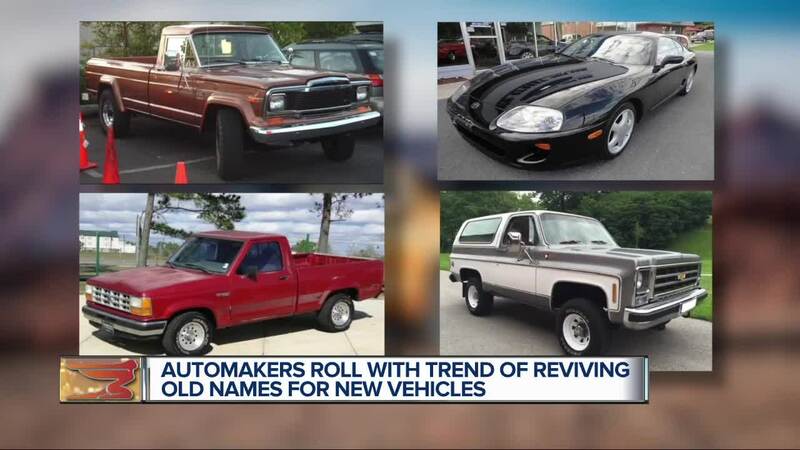 (WXYZ) — Car companies are bringing back discontinued vehicles, and those rebirths are being announced at this year's North American International Auto Show. According to an article in USA Today, Chevy, Ford, Honda, Jeep and Toyota have all jumped on the resurrection trend by bringing back cars that were discontinued years ago. And the reason is quiet simple – they’re cheaper to build, the auto maker already owns the name and people really resonate with it. However, reviving the dead cars comes with a lot of pressure. "It does make sense," said Joe Wiesenfelder, executive editor for cars.com. If you thought the cars of old were gone forever, you're wrong. They're making a comeback in a very big way. "It’s about being true to the memory," Wiesenfelder said. Some people say it’s a great idea to revive the dead vehicles. "We haven’t been having those cars for 10 years, a decade," said Joe, a visitor of the auto show from Boston, Massachusetts. Some models have been discontinued for even longer like the Jeep Gladiator. Ford is bringing back the Ranger, Honda is bringing back the Passport SUV, while Chevy and Toyota are bringing back the Blazer and Supra, respectively. "What ends up really mattering is whether the consumers are interested," Wiesenfelder said. So, why bring back cars from years back? "It’s not so much nostalgia as it is the automaker filling holes in their lineups," Wiesenfelder said. Sounds like a home run. However, introducing new cars of the past does come with immense pressure. "The downside is if the new vehicle doesn’t quite match the expectations set by the name and we saw that happen. We saw that happen with the Pontiac GTO," Wiesenfelder said. Whether your interest is new cars or old ones, the revive of these vehicles that once stood at the top is something to get excited about. So far, the Toyota Supra, Jeep Gladiator and Ford Ranger have been announced as come-back vehicles at this year's NAIS, which kicked off Monday, Jan. 14., and will go until Sunday, Jan. 27. The Toyota Supra rode onto the scene in 1978 and production stopped in 2002 with the A80 Supra. The Supra is being resurrected with the 2020 GR Supra, and Toyota is calling it " no mere sports car. " The Jeep Gladiator was built from 1962 to 1988. Now, the pickup truck is back with a vengeance as an all-new 2020 midsize pick up. Lastly, the Ford Ranger, which was discontinued in the U.S. and in Canada in 2011, is back . For more 7 Action News coverage of the 2019 International Auto Show, click here .